The ALC15 twilight switch will turn lighting on when the ambient light falls below a preset level. The lighting will then be turned off when the light exceeds the preset level or after a preset time delay. 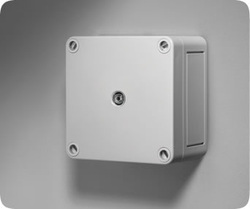 For example, they can be used to switch external security lights at night or to turn on display or sign lighting. The unit has a highly accurate adjustable photocell; a selectable time delay; adjustable switching differential and is mounted in a vandal resistant IP66 enclosure.